That's right, I said sale. 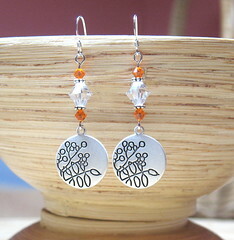 Thanks to a cool new feature at ArtFire, we're have a 20% off sale on all of the jewelry in our shop there. Lots of earrings from our Etsy shop have even been temporarily moved there so you can have a wider selection to choose from. The sale ends this Saturday, October 10th and use the code OCTOBER at check-out. More frequent entries coming soon about my new precious (i.e. MacBook), why weekend with your girlfriends rock, and the dates for this year's holiday shopping open houses.